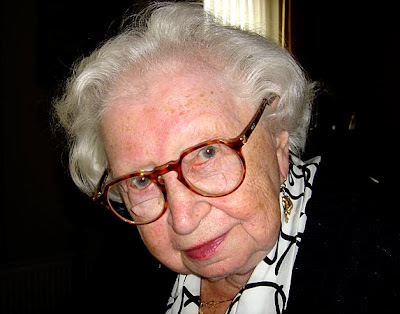 Miep Gies died Monday night at the age of 100. She was the last surviving and best known helper of Anne Frank and the seven other people who shared a hiding place for 25 months in a canalside house in Amsterdam during the Nazi occupation. She also saved Anne's diary and became a worldwide symbol for those who unselfishly fight for their fellow men in times of war and oppression. For two years Miep, her husband Jan and four other helpers (Victor Kugler, Johannes Kleiman, Bep Voskuijl and Johan Voskuijl) risked their lives supplying food and other essential items to the Franks (Otto, Edith, Margot and Anne), the van Pels (Hermann, a business colleague of Mr. Frank's, his wife Auguste and their son Peter) and dentist Fritz Pfeffer. After the arrest of the people in the secret annex, Miep and Bep gathered up Anne's diary papers that were scattered all over the floor. Miep intended to return the diary to Anne, knowing how important it had been to her. She locked it away and never read a word. At the end of the war, Otto Frank returned from Auschwitz. Eventually he learned that both his daughters had died in Bergen-Belsen in March 1945, less than a month before the camp was liberated. Miep was with him when he received the news. She gave Anne's diary to him. Otto had it published in 1947 with the title The Secret Annex. Since then The Diary of a Young Girl has been translated into 70 languages and is one of the most widely read books in the world. Miep Gies, born Hermine Santruschitz, came from a Roman Catholic family in Vienna. She was one of the many Austrian children suffering from the shortage of food in the wake of World War I. She was sent away to be cared for by a Dutch family, who gave her the Dutch nickname Miep and eventually adopted her. When she was 13, her adoptive family moved to Amsterdam where she later became a secretary to Otto Frank. In 1942 he asked Miep if she would help shelter the family and she agreed immediately, replying "Yes, of course." Her husband Jan also pledged his unconditional help. Miep brought food, books and news of the world outside. She was also a confidante to Anne, bringing her paper for her diary and her first pair of high-heeled shoes. Miep and Jan, who was involved in the Dutch resistance, hid an anti-Nazi university student in their own apartment as well. Although she later lived quietly in Amsterdam as a homemaker, Miep began to travel widely after she published her memoir Anne Frank Remembered in 1987. She spoke about the Holocaust and against intolerance, often to schoolchildren who were reading Anne's diary. Miep Gies has been honored by many countries. She was knighted by Queen Beatrix of the Netherlands for her heroism and dedication, honored by Yad Vashem, Israel's official authority for the commemoration of the Holocaust, and by the German government and B'nai B'rith in the USA. Jan Gies died in 1993. Miep Gies is survived by their son Paul and three grandchildren. You can watch the six-part documentary "Dear Kitty" Remembering Anne Frank, with Part 1 starting here on YouTube. To see and hear more of Miep Gies, click here for her appearance in another documentary. The Miep Gies website is here, with videos that should not be missed. Attention Parents: The Grasshopper Hopped!